Photocopy of your Nepalese visa. 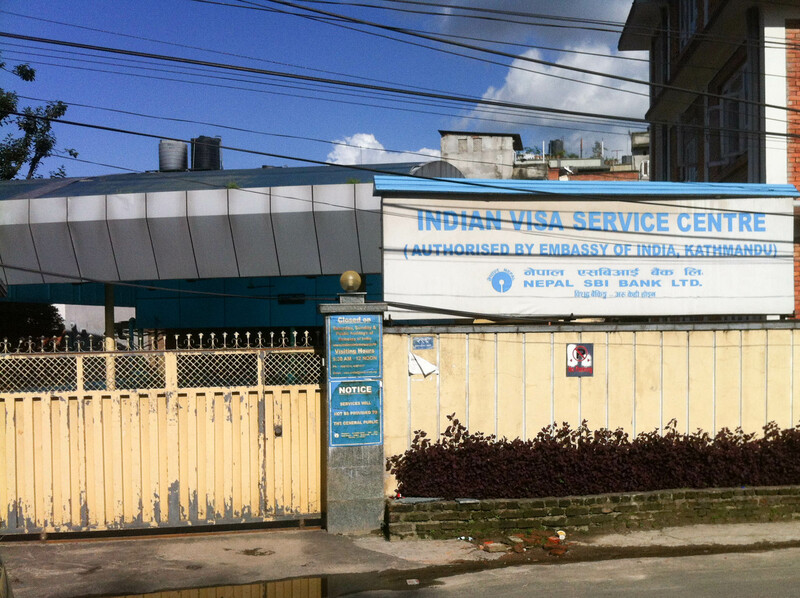 The Indian Visa Service Centre, House No.296, Kapurdhara Marg, Kathmandu. This is a separate building to the Indian Embassy (though they are near each other). Once you have completed the form, print it and bring it to the Indian visa service. Enter through the yellow gate, and a security guard will open it and search your bag. Take a number and wait to be called (we only waited two minutes, though this was off-season). Once your number is called, go to the desk and give your printed application, passport, passport photocopy, Nepalese visa photocopy, and photo. The photo must be sized 2″ x 2″, and these are available at one of two shops next to the visa service. Once your application has been received, go to the next counter and pay the fee. This is paid in Nepalese rupees, and the amount varies by country. As an Irish citizen, I was charged NPR 4,900, and, as a UK citizen, my partner, Adam, was charged NPR 14,450 (I tried to keep the gloating to a minimum). You will be given a receipt and told when to come back. Your visa will take five working days to process (there is no express service), during which time you keep your passport. After your visa has been processed, you must return and hand in your passport. You will be given back your receipt, with a time to collect your passport, complete with visa, the following afternoon. You can apply for a one-month, three-month, or six-month visa, with single, double, or multiple entries. If you select one month, the visa will start from the date of application, NOT the date of entry into India. Hopefully this post has covered everything you need to know about applying for an Indian visa in Kathmandu. If you’ve any questions, feel free to ask via the comments! I would like to know for how many months and entries they authorized your visa ??? Six months or three months ??? I applied for a one month visa, though they also issue three and six month visas (single, double or multiple entries). Whichever one you get, the validity starts from when you get the visa, not from when you enter! hi, thanks so much for the article, it helped us a ton. We were told today that its not possible to get six month visa in the centre, just the one and three month (which we need anyway,i just wanted to let people know here). Hello Ailish! This is very helpful. 🙂 Did the service center ask for flight tickets or hotel bookings? No, they didn’t ask for either of these. We were taking a bus and we hadn’t got the tickets yet. Also we were staying at someone’s home, and then at a monastery, so we didn’t have any bookings. We needed to give an address for where we were staying, but not a booking. Enjoy your trip to India! I see, thanks for the reply. It’s always fun in India, I’ve been there twice but only on visa-on-arrival. I plan to go June 2016 (by voa for 30 days) then fly to nepal to stay for 2 months or so before I go back (hopefully with a 6 month visa this time). Do you think having a VOA stamp before would affect my application? I am UK cirizen. Do you know if the fee for three months is the same as one month (NPR 14,450)? Thank you for the info. I am traveling with my wife and three small children. Can I apply for all of them by myself or do they need to come with me? It should be ok for you to apply for all of them as long as you have their passports, forms and photos. I’ve had other people apply for visas on my behalf and it’s been fine as long as they have all of my signed forms etc. But I really can’t speak for this particular embassy, and it’s probably best for you to contact them directly. Glad you found the post useful. Enjoy your trip to India! look for. You have ended mmy 4 day long hunt! God Bless you man. Have a great day. Hi Zatara, Thanks with special connection can have six month but not guarantee i am travel agents and did few recently. sri lanka is still issuing too. Hi Ailish! One question: as I don’t want to stay in Kathmandu over a week just waiting for my visa would it be ok to apply but then go to pick it up later than the date they tell you to come? That should be ok, but bear in mind you won’t have your passport that week, so it might be tricky to book bus tickets and check in to hostels without it. Thank you for sharing ‘what to do’ very straightforwardly, Ailish! Good to know ahead of time I’ll need Nepalese rupees to pay with. Also that the passport photo must be sized 2″ x 2″. I’m sorry, I don’t know if the photo can be different, you’d have to check with the embassy. I think you can pick it up on a later date, though bear in mind you’ll be without your passport in the meantime, and travel can be tricky as most hotels ask to see your passport. Good luck! Fellow paddy here… I am currently in Kathmandu with my partner and we will fly to India next week. From my research it looks like I can simply request an evisa online and not bother with this embassy/manual process at all. Can you confirm agreement with that? Kathmandu is a very good place. I like to roam to Kathmandu. But for Kathmandu, we have to get a visa and for this information, i was searching for Visa information on Google and I found your blog and found important information from your blog which is very useful for me. Thanks for sharing the great information. Good Luck! thanks Ailish, to provide such a good and informative blog but can you tell me if i apply visa from govt website its right or i should try your website please reply me. Hi Andrew, please apply directly through the government website. Good luck!